Ships within 14 business days. Please allow up to 1 additional week transit time for your item to arrive. 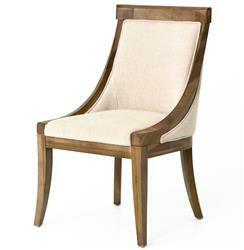 Consider this a sophisticated and straightforward choice for a dining chair or anywhere accent chair. Lustrous limed birch is stylishly silhouetted with sloping arms and slightly splayed legs. Enjoy a fresh cup while sitting in comfortable textured cotton inspired by cafe au lait. Easily relating to traditional and modern dining spaces, this side chair invites relaxing style to the head of the table.